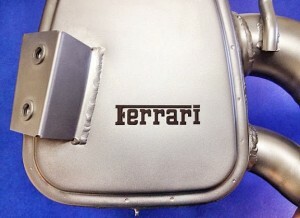 Laser Engraving Ferrari Muffler auto part. Logo is 0.002″ deep into surface. This entry was posted in Laser Etching / Laser Marking (Dark) and tagged Industry: Automotive on August 11, 2014 by universalmarking.